It was one of the most unexpected e-mail questions I’ve ever received. The sender, living in the southern section of the US, wanted to know if he should sell his house and move into the country. He had heard how all the “influential” and “most respected” members of the FUS faculty had done this. The “fact” that our University had begun farming also added to his concern. Would it be prudent for him to do the same, to protect his young family from the coming anarchy? This message would have been humorous were it not for the fact that many other sincere people throughout the world are asking similar questions, and making major decisions based on hearsay and rumor. Their concerns stem from alarming projections about problems likely to be caused by a computer “bug,” which many literally believe will end life as we know it: the so-called Y2K problem. For those who may not know yet, the Y2K, or Millennium Bug, is the result of our efforts to save money in the 60s and 70s. Back then computer memory was expensive so, to save memory, the year was represented with the last 2 digits instead of 4 digits. The date May 20, 1954 was represented by 052054 or 540520. This has worked fine until now. But with a new century looming, we have a problem. May 20th of the year 2000 will register with computers as 052000 or 000520. These numbers are indistinguishable from the representation of May 20, 1900. This problem is further acerbated in embedded systems-specialized computer components designed as parts of larger devices. These systems can control the temperature in a refrigerator, the monitor of a life support system, the engine of a modern tractor, or the fuel rods of a nuclear power plant. These cannot be simply reprogrammed. In many cases, the entire system needs to be replaced. It is argued that Y2K will render many of our technological devices useless. Those systems not directly effected will be incapacitated as supporting systems crash, bringing about the end of civilization as we know it. Or will it? Certainly there is potential for serious problems in some areas. It is conceivable that Y2K malfunctions could cause electric power brown- or black-out in portions of the US for a short time; that failing computerized factory machinery temporarily stop production for some companies, and that some computerized records be corrupted. Yet much of what we hear concerning the Y2K is rumor, misunderstanding, and hype. There are a number of conditions that must be met for the Y2K to cause serious problems in a particular computer system. 2. Time calculations that involve years must use dates stored in a Y2K sensitive form, such as yy/mm/dd. There are many ways to implement time storage and calculations on a computer. Many of these are based on the number of seconds or days that have elapsed from a fixed “date.” Thus an embedded system can execute a yearly test after 365, 730, 1095, and 1461 days have elapsed without referring to the actual date. These methods generally use less memory than Y2K-sensitive methods and are usually employed in systems that do not require a human user to enter or see a date. Most embedded systems are in this category. 3. The failure of the system must be significant. Many camcorders keep track of the year. In the year 2000, many will record 1900 on the tapes they make. Big deal. Thus, unless these 3 conditions are met, the computer system will not be significantly affected by Y2K. There is another fact that is frequently overlooked in Y2K “consciousness raising.” Y2K failures will not be confined to the first week of January 2000. They began in the year 1993 (BYTE) and will continue at least through 2003. It is estimated that only 8% of the Y2K failures will occur on 1/1/2000. (USA Today website 11/13/98) As of March 1998, over 35% of large US companies have experienced some sort of Y2K failure. (BYTE) As they occurred, they were corrected, with minimal, if any, inconvenience to the public at large. (The worst case seems to have been a credit card company whose cards dated 00 failed. I have a friend who received one of these cards.) More of these problems will be discovered and corrected in 1999 as major corporations, governments, and governmental agencies switch over to their fiscal year 2000. (Japan, Canada, and New York State begin their fiscal year 2000 in April 1999. Their experiences should be a good preview of 1/1/2000.) Thus the “Y2K disaster” will probably be more of a period of inconveniences, mainly of a minor nature, lasting several years long. 1. Carefully check all financial statements for any strange figures. 2. Make hard copies of all records stored on computers. 3. Check the Y2K status of your personal computer and software. 4. Have some extra cash and food on hand for the weekend of 1/1/2000. 5. Check into what your community has planned should there a disruption of some utilities in your area. 7. Verify your information and don’t accept hearsay or rumor. When you hear how some group is preparing for the worst, carefully confirm the facts. Remember that some people believe that FUS is farming and her faculty has fled to the hills. Check also to see if the information’s source has a bias. Many of the prophets of doom are also selling products to “help” those “wise enough” to purchase them. There are also those individuals who see in the coming Y2K “disasters” confirmation of their personal eschatology. Whether Y2K is a minor inconvenience or a major disaster, Jesus is still victor! Dr. Kovach is an assistant professor of computer science at FUS. 1. BYTE - DeJesus, Edmund X. “Year 2000 Survival Guide”, BYTE Vol. 32, Number 7, July 1998, pp. 52-62. 2. PCWeek - Madden, John. “IT seeks savings to offset Y2K, e-commerce spending”, PCWeek Vol. 15, Number 45, Nov. 9, 1998, pp. 1, 20. 3. 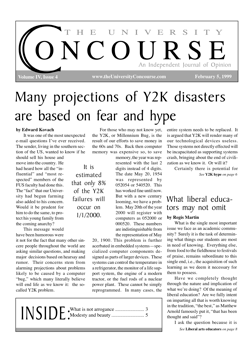 Zuckerman, M.J. “Y2K: Minor glitch or major disaster?”, USA TODAY, 31 Dec. 1998. 4. The Kansas City Star-“Experts who have warned about Y2K say chill out” - http:/www.sjmercury.com/business/tech/docs/028169.htm.